Note: This is a Steam installer, which means you need a valid copy of Half-Life/Counter-Strike. The Half-Life/Counter-Strike package can be bought via Steam for €7.99. CoSyN, your steam problem might be from the internet, you can check it out by connecting to a server. You could try CS.XtremeXPC.Com for example. Great game, cheap and above all, with a great online community. I already have the latest Steam installed in to my PC. When I installed this one, both versions say "Error: Could not connect to Steam network." Could anyone please help me? Thank you so much in advance, as I am a former CS:S player who is extremely interested in 1.6. 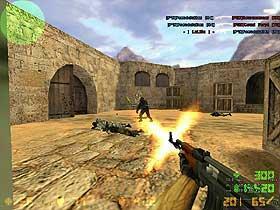 This is the original CS. Probably many are looking for the "pirated" copy but if you are a real CS player, you should buy this, it's cheap and it's worth it.